Do you really think of yourself as the Mormon Cartoonist? For the first nine and a half years of this website it was known as mormoncartoonist.com. Consequently, I was sometimes referred to the Mormon Cartoonist. I never claimed to be the Mormon Cartoonist just a Mormon Cartoonist. There are plenty of talented cartoonist who could lay better claim to the title, but none of them laid claim to the domain name before me. In October 2018, the name of the website was changed to wardcartoonist.com and I now aspire to someday become the stake cartoonist. Can I reprint one of your gags or comic strips for my ward newsletter, letter to a missionary, etc? Nothing would please me more. As long as you’re not using my work to turn a profit (something I haven’t been able to figure out how to do), please feel free to use it. Do you accept readers’ submissions for gag ideas? You bet. Just drop me an email with your idea. There are some ground rules you’ll need to understand: 1) there’s no guarantee I’ll use your joke, 2) I might rewrite it or otherwise twist it, 3) it may take months before it shows up on the blog, and 4) you’ll get no compensation for the joke other than the honor (?) of seeing it published on the website. What’s the deal with the pinewood derby? A long time ago, I submitted a pinewood derby gag to the New Era and was disappointed when they opted not to publish it. Fortunately, I had another pinewood derby gag ready to send the New Era with my next batch of submissions. Only, once again they opted not to publish it. 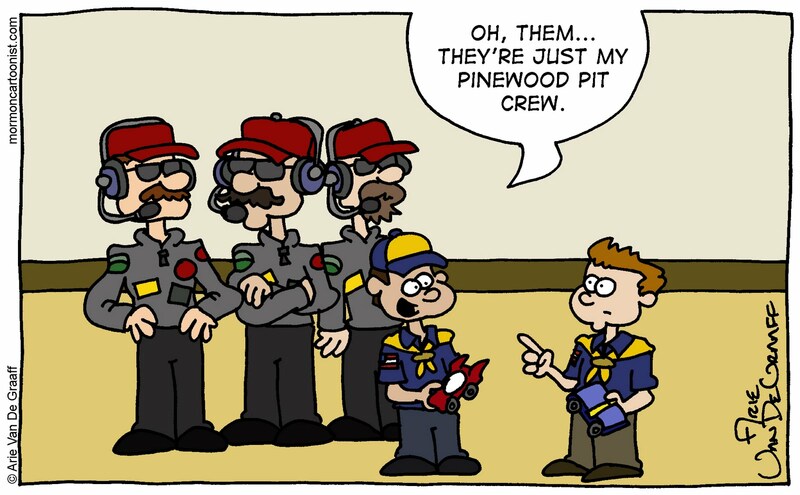 From that day on, I made it my goal to see the New Era publish a pinewood derby gag. On the blog I made several references to this piece of unfinished business until, finally, the New Era took pity on me (or was tired of all the submissions) and finally published a pinewood derby gag in the March 2011 issue. Since then the blog has been running joke free (some would say any joke free, but that's another issue). The winning pinewood derby submission. What’s the story with your missionary comic strip? That’s a topic that deserves its own page. Will you ever do apps for android? I would love to do android apps. To do so, though, I need to find an developer who can make the apps as pretty on an android as they are on Apple products. So far, I haven't found that developer yet. Will you draw up the new apostles? I like to show your pictures to my primary kids! It is fun to have them guess who they are. I just drew them for the October 2015 General Conference recap packet. What can i do to have them in spanish? 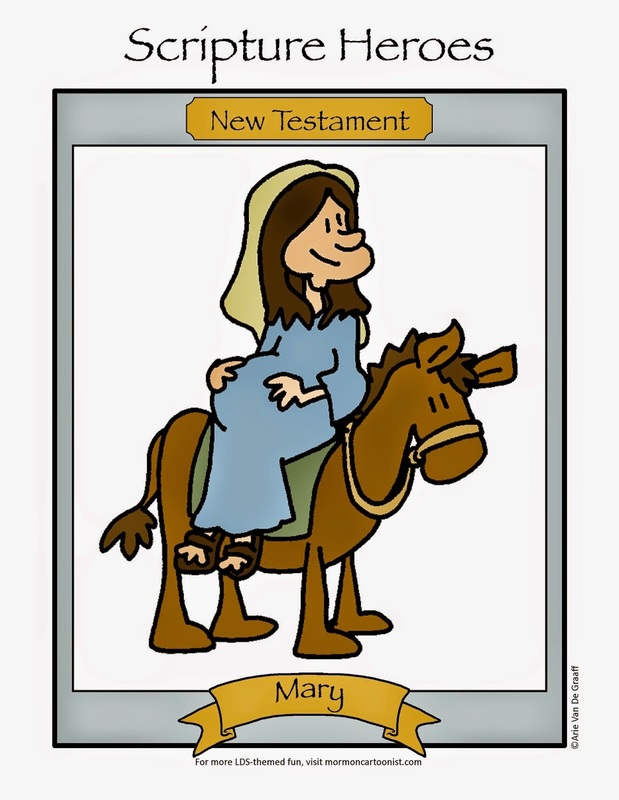 Do you still offer the coloring packet from the LDS Scripture Hero app? I wish I could. The coloring pages I did for the LDS Coloring Book app don't belong to me. You might have better luck appealing to LDS Mobile Apps. How do I share your Conference Activity Packet with my ward Primary on our Facebook Page? Copying and pasting the link should do it. It's sharable with just about anyone. Will you be creating an April 2018 Conference Activity Packet? Pretty PLEASE!! Is there a way to search your cartoons for a specific topic? Thanks. Love your work!! You can try searching a specific word or topic on the little box on the left hand corner. Likewise, if you find one comic you like, you can click on one of its labels at the bottom of the post and any other comic with the same label will pull up. Or you could just memorize each and every comic featured on the site!